Intergalactic Planet Registry Renaming the planets you know for the people you know! 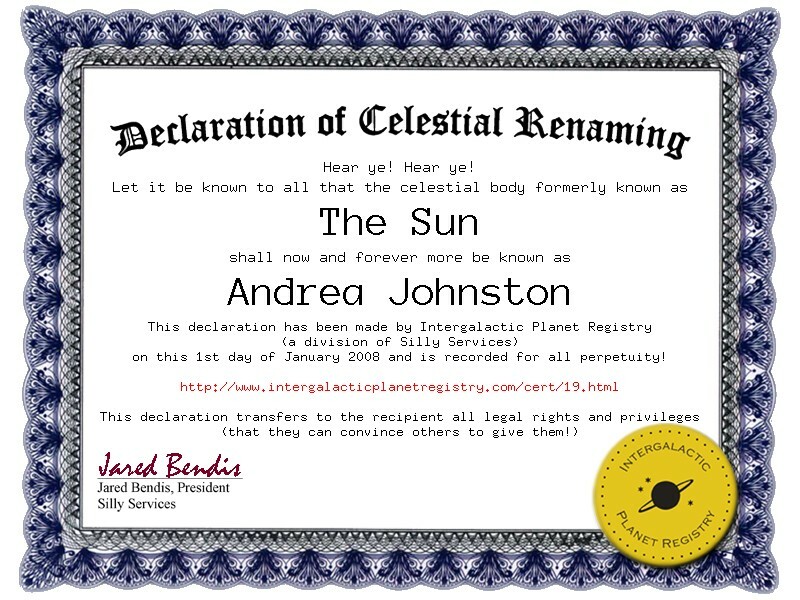 Here at the Intergalactic Planet Registry we rename the planets after your friends and loves ones and email them an 'official' Declaration of Celestial Renaming. Think of the joy of telling all your friends that Jupiter is now named Steve. Have you seen the big red spot on Steve? I heard Steve is enormous! Perfect for the astronomy buff or anyone who wants to claim their place in the heavens! So go ahead and click Order Now: Name a Planet and get your Declaration of Celestial Renaming today!